With unparalleled artistry and enduring vigor, the Juilliard String Quartet continues to inspire audiences around the world with its performances. 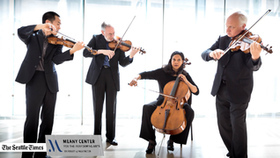 Founded in 1946, and widely known as "the quintessential American string quartet," the Juilliard draws on a deep and vital engagement with the classics, while embracing the mission of championing new works – a vibrant combination of the familiar and the daring. 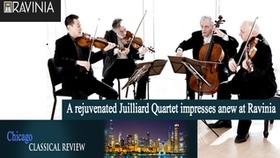 Each performance of the Juilliard Quartet is a unique experience, bringing together the four members' profound understanding, total commitment, and unceasing curiosity in sharing the wonders of the string quartet literature. Having welcomed cellist Astrid Schween and celebrated its 70th anniversary last season, the Juilliard String Quartet marks the 2017-18 season with highly anticipated return appearances in Seattle, Santa Barbara, Pasadena, Memphis, Raleigh, Houston, Amsterdam, and Copenhagen. 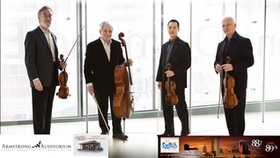 The Quartet continues its acclaimed annual performances in Detroit, Philadelphia, and at the Ravinia Festival, along with numerous concerts at home in New York City, including appearances at Lincoln Center and Town Hall. The season kicks off with the release of a new album featuring the world premiere recording of Mario Davidovsky's Fragments (2016), together with Beethoven Op. 95 and Bartók No. 1. Highlights of concert programming throughout the 2017-18 season include visionary works by Beethoven, Bartók, and Dvořák, as well as James MacMillan's haunting and evocative Quartet No. 2, Why is this night different? (1998). The Juilliard String Quartet's groundbreaking interactive app on Schubert's "Death and the Maiden", was released in 2015 by the innovative app developer, Touchpress, jointly with the Juilliard School. Both the app and the JSQ's 2014 recording of the "Death and the Maiden" are available on iTunes. Celebrating one of the great collaborative relationships in American music, Sony Classical's reissue of the Juilliard Quartet's landmark recordings of the first four Elliott Carter String Quartets together with the 2013 recording of the Carter Quartet No. 5 traces a remarkable period in the evolution of both the composer and the ensemble. 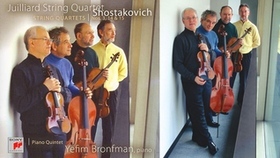 The Quartet's recordings of the Bartók and Schoenberg Quartets, as well as those of Debussy, Ravel and Beethoven, have won Grammy Awards, and in 2011 the Quartet became the first classical music ensemble to receive a Lifetime Achievement Award from the National Academy of Recording Arts and Sciences. Devoted master teachers, the members of the Juilliard String Quartet offer classes and open rehearsals when on tour. 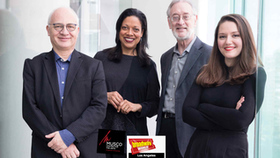 At the Juilliard School, where they are the String Quartet in Residence, all are sought-after members of the string and chamber music faculty, and annually in May they are hosts of the 5-day internationally recognized Juilliard String Quartet Seminar. During the summer, the JSQ works closely on string quartet repertoire with students at the renowned Tanglewood Music Center. 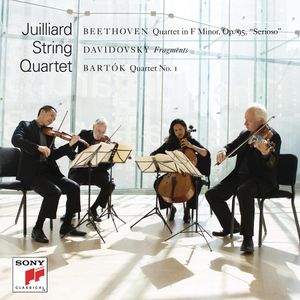 America's greatest and most enduring chamber ensemble – the Grammyâ Award-winning Juilliard String Quartet – celebrates its eighth decade with the release of a new Sony Classical recording of music from three centuries by Ludwig van Beethoven, Béla Bartók and Argentinian-American composer Mario Davidovsky. The new recording was released on October 26, 2018. A movement of the Beethoven quartet on the recording is available now via all digital and streaming platforms. The Juilliard String Quartet, widely known as the quintessential American string quartet, appeared at Armstrong Auditorium on Thursday, January 15th presented by the Armstrong International Foundation's Performing Arts Series. Founded in 1946, the Quartet was the first ensemble to play all six Bartok quartets in the US and its performances of Schoenberg's quartets helped establish the works as cornerstones of the modern string quartet literature. In 2011, the Quartet became the first classical music ensemble to receive a Lifetime Achievement Award from the National Academy of Recording Arts and Sciences. For nearly seven decades the Quartet has made manifest the credo of its founders to "play new works as if they were established masterpieces and established masterpieces as if they were new. The Quartet's members are Joseph Lin and Ronald Copes, violins, Roger Tapping, viola and Joel Krosnick, cello and the concert program features the String Quartet in G Major, Op 33, No. 5 by Franz Joseph Haydn, the String Quartet No. 2 "Vistas" of Shulamit Ran and the String Quartet in F Major, Op 135 of Ludwig van Beethoven. First violinist Joseph Lin offers commentary about the Quartet's mission, mystique, commitment to teaching and the concert's works. Performance Oklahoma is heard on Saturday evenings at 8pm on Classical 88.7-1! Juilliard String Quartet Touring U.S. Throughout the 2006-07 Season One of the most influential ensembles in contemporary American music, the Juilliard String Quartet celebrates its 60th anniversary with a new Sony Classical recording of three string quartets of Dmitri Shostakovich – No. 3 in F Major, Op. 73; No. 14 in F-Sharp Minor, Op. 142; and No. 15 in E-Flat Minor, Op. 144. For this new release – which also honors the 100th anniversary of the composer's birth – these new performances are coupled with the Juilliard's acclaimed 1999 recording of Shostakovich's Quintet for Piano and Strings in G Minor, Op. 57, with pianist Yefim Bronfman. This specially priced two-CD set will be in stores October 11. The new recording renews the Juilliard String Quartet's long and distinguished association with Sony Classical that began in 1949, when the label was known as Columbia Masterworks. 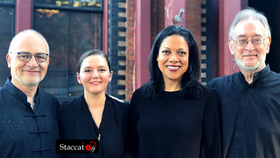 Founded three years earlier at New York's Juilliard School of Music, the quartet continues as Quartet in Residence at Juilliard – which is also celebrating its centenary in 2006. They were also Quartet in Residence for 40 years at the Library of Congress in Washington, D.C. Since 1997, the quartet's members have been Joel Smirnoff and Ronald Copes, violin; Samuel Rhodes, viola; and Joel Krosnick, cello. Its catalogue of more than 100 recordings has won four Grammy Awards and, in 1986, earned the quartet a place in the Hall of Fame of the National Academy of Recording Arts and Sciences. During the current concert season, the Juilliard String Quartet will be performing throughout the Unites States. Its schedule includes concerts in Concord MA on October 8; Dallas on October 22-23; New York (at Washington Irving High School) on October 28; Philadelphia on October 29; New York (Alice Tully Hall) on November 8 & 10; Tempe AZ (at Arizona State University on November 16 & January 24, 2007; Houston on January 26 & 29, 2007; the University of Tennessee (February 12, 2007); and New York (Alice Tully Hall) on March 1, 2007. The decision to record three of Shostakovich's fifteen quartets, which are among his very finest works, reflects the Juilliard String Quartet's strong connection with the music of its time. In fact, the earliest of the quartets – No. 3 in F Major, Op. 73 – had its premiere the same year the Juilliard was formed. The other two were written in the early 1970s, shortly before Shostakovich's death in 1975. The Juilliard has an all-inclusive repertoire of over 500 works, premiering more than 60 compositions by American composers. In addition, its enduring advocacy of the chamber music of Bart?k, Carter, Ives, Jan?ček and Schoenberg has helped cement their place in the modern repertoire. The quartet is also broadly admired for its influence on string players worldwide, and continues to take an interest in the formation of new American quartets, among them the Alexander, Colorado, Emerson, New World and Lark. 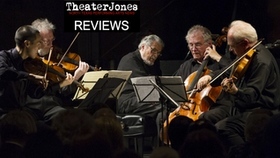 As the Los Angeles Times wrote, "The Juilliard String Quartet remains the standard by which all other quartets must be judged." The Chicago Tribune has written of the players, "Each of the four has a notably beautiful tone, a sound that sings out but also blends. They show a shared understanding of the music they play; every bow stroke adds to its meaning and integrity.